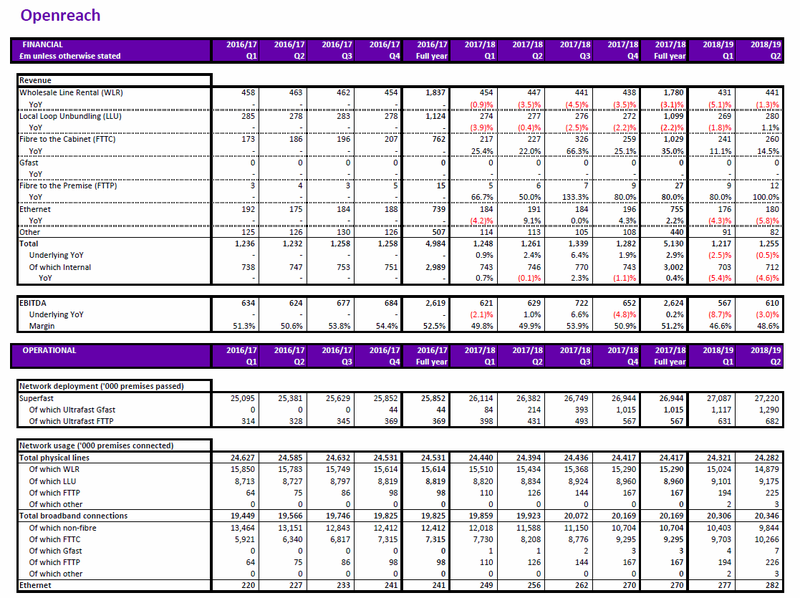 The Q2 and half year results for the BT Group for the period until 30th September 2018 has been published and the effects of both price regulation and the price reductions to ISP customers to drive more VDSL2, G.fast and FTTP take-up are apparent. For those who buy their retail broadband from BT Consumer who are feeling that they are paying more than a year ago, then yes that probably is the case and with the Consumer division being the only one showing an increase in profits there is probably not going to be massive changes, unless things like the super complaint from Citizens Advice was to result in out of contract pricing being forced down - though if this was to happen we would expect the introductory offers to be more expensive and thus balance everything out on the balance sheet. One of the regular complaints is the increasing cost of line rental but the results show that the revenue going to Openreach to actually run the copper local loop is decreasing. The real story for BT Group as far as the broadband world is concerned is what Openreach is up to and the screen shot from the supporting documents shows what is going on. The figures for the FTTP footprint at 682,000 premises passed and 226,000 live connections gives a take-up rate of 33.1% but as more retail providers start to promote the full fibre service we are likely to see the take-up rate increase, but there is a real chance that in with decent VDSL2 speeds and Virgin Media DOCSIS competition the take-up levels may be lower. Full fibre is the future, but for the average person on the street it can be a hard sell to convince them to pay for an upgrade, unless in their home there is lots of disconnects due to VDSL2 problems or the extra speed is something they will pay for. The G.fast footprint is growing and with Openreach declaring 1,290,000 premises within reach of a live pod the speed with which the pods can be rolled out compared to FTTP is apparent. Alas at this point in time the take-up level is very low with just 7,000 live connections, which is lower than we had guessed at since we have started to see more and more speed tests and was expecting something more like 30,000 live connections. Of course it is easy for providers to state nice and large and rapidly increasing footprints, hence why we spend so much time and effort tracking everything broadband related. As of the early hours of 1st November we knew of 619,154 premises of FTTP and 1,033,847 premises of G.fast, so clearly more is to be found but on G.fast we do know of pods that Openreach is saying are live but none of the wholesalers is offering a service yet, i.e. most likely waiting on backhaul upgrades at the handover node. 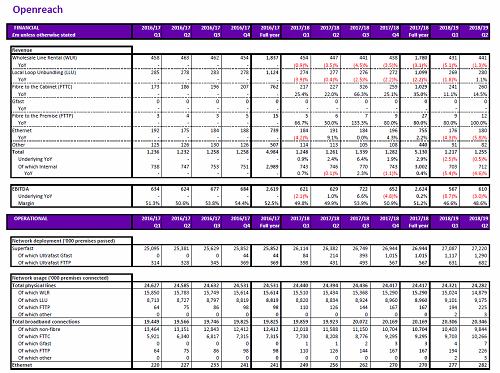 The financial results talk of Openreach building around 13,000 premises of FTTP per week at present, but there is a difference between built and ready for order, things like waiting on backhaul upgrades and other things where all the final manifolds are built in a number of streets but one key part of the route back to the aggregation point may be held up due to a ducted block and waiting on a suitable date to do the roadworks to clear the block. Our tracking of the FTTP figures also will not include new build for postcodes that appeared in August, September and October since until the ONS postcode dataset is released we cannot integrate the postcodes. Revenue decline for the half year was driven by around £150m of regulated price reductions on FTTC and Ethernet products, £30m of non-regulated price reductions mainly driven by a number of major and smaller communications providers that have signed up to our pricing discounts offer for volume commitments, and a decline in our physical line base. This was partly offset by underlying growth of 25% in our FTTC rental base and a 10% increase in our Ethernet rental base. Providers such as Sky are now signed up to the volume commitments and one very visible result is the push to get more people onto the 80/20 FTTC service and while there are no retail FTTP products from the operator we do see some fibre only new build properties with Sky customers so some limited sales have started and thus probably only a matter of time before ultrafast services appear. The effects of the commitments to volume is having an impact on the financials and is changing the assumptions on take-up for BDUK project areas, with even more now available for contracts to announce further micro-projects if they want to. It is often mis-understood but under the BDUK contracts the BT Group cannot keep building and recycling the money automatically, it can only build the contracted amount and if gainshare means more money is available particularly when combined with other savings the decision to build more must come from the public body. Some may spot the Ethernet footprint in the results at 282,000 lines which is higher than the number of FTTP lines (226,000) and a quick glance at the revenue each generates just £12m for FTTP versus £180m for Ethernet could be said to support the theory that says Openreach is not keen to roll-out FTTP as it will decimate the Ethernet revenue. While it is clear that a massive FTTP roll-out will eat into the Ethernet share, what is other overlooked is that Ethernet services have very different service levels, resilience and bandwidth guarantees which are very important if when your broadband breaks you become a loss making business - so while FTTP will eat into the low end Ethernet customer base, it may in time as more of the business market adopt a digital first model actually grow. Reasons to believe this may be the case is the money CityFibre is spending which on its roll-out where the business Ethernet and dark fibre customers are key customers, with the GPON roll-out to residential and the real small business market being the icing on the cake. In summary, the revenue trends and cap-ex are going going to continue perhaps for a decade or more and this is the biggest question, will the shareholders both big and small accept that the shift from a copper telco to full fibre telco is going to cause some short term pain but long term gains. Also worth noting that as of the last quarter the number of fibre-based broadband connections has exceeded the number of non-fibre connections. Quite a landmark moment really. Just to let you know there have been a lot of G.fast pods installed in the NR7 area of Norwich recently. Andrew, Para 6, the 7k G-Fast workers will be at 31 Sep, I think your 30k is more up to date than that? which would explain the difference. Certainly seems to e growing fast. The 30k estimate was based on what we saw in October, so yes the 7,000 is old, but doubt they'll have grown by 23,000 in 4 weeks. Last two months has seen more people popping up using the service compared to earlier in 2018 for sure.